With four generations of handed-down Italian family recipes, we offer antipasti, regional country-style pastas, cannelloni, osso buco, risotto, crisp-crusted pizzas and traditional Italian desserts. Our pantry is filled with local Monterey Bay seafood, seasonal herbs & vegetables from nearby small farms in the Salinas Valley, as well as locally hand-made mozzarella and goat cheese. From Italy we import Prosciutto di Parma, extra-virgin olive oil and aged cheeses such as Reggiano Parmesan and Pecorino Romano. Enotria Café and Wine Bar is a fine dining café and retail wine shop located in the heart of the Uptown Arts District at the corner of Del Paso Boulevard and Arden Way. Enotria serves award-winning California/Mediterranean cuisine complimented by Sacramentoís BEST WINE LIST (as chosen by the readers of SACRAMENTO Magazine and Sacramento News & Review six years running). Enotria CafÈ was recently honored with The Wine Spectator Award of Excellence. Vincent DePhilippis and Madeleine Stefani came to America in 1922, Vincent from Italy and Madeleine from France. They met in New York and married in 1925 and settled in Philadelphia. In 1950 they moved to San Diego where they opened a deli grocery on India Street, which was called Filippi's Cash and Carry. This was the beginning of what was to become a successful line of family restaurants. Today Filippi's Pizza Grottos are owned and operated by family members of the original founders. Our family would like to welcome your family to visit our restaurants and enjoy the traditional family recipes that our family has been serving for over 50 years! With 17 location throughout California, you should be able to find a restaurant near you. LoRusso's Cucina is an independent Italian restaurant in the St. Louis' Little Italy area know as the HILL. For over 20 years, Rich & Terri LoRusso has raised the level of Italian cuisine and is very involved in community and charitable projects. Luciana's was built in the 1930's and has been owned and operated by the Luhan family since 1983. The decor is reminiscent of a cozy European style inn. Total seating capacity equals 149. There are three areas for dining as well as a private Wine Cellar area: the Atrium (complete with fireplace) accommodates a total of 16 guests; the Library accommodates a total of 40 guests; the front room (also furnished with a fireplace) accommodates a total of 75 guests and the Wine Cellar accommodates 18 guests. 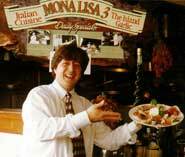 Mona Lisa Ristorante is a family owned and operated Italian restaurant that is possibly the best kept secret in San Francisco. They have a very extensive menu of pastas, housemade pizza, and antipasti. Each dish is lovingly prepared with great flavor and artistry. We think this is the best pizza in North Beach. Sidewalk dining. Medium sized indoor dining room. A very popular lunch destination for the Financial District set. Banquets, catering & weddings services. Ask them about delivery! North Beach Restaurant is an enduring and world famous San Francisco destination point noted for serving authentic Tuscan cuisine. Owner Lorenzo Petroni and Chef/Owner Bruno Orsi have established their restaurant as one of San Francisco's culinary gems and celebrated their 26th anniversary with a total remodeling that took 2 1/2 years to complete. Leading Southern California restaurateurs Laurie Neuse and Cary Hardwick have created a meeting place for LA and Orange counties in their award winning restaurant Spaghettini Grill and Jazz Club (A place with fantastic atmosphere, lots of excitement, superb modern and classic Northern Italian cuisine and of course, some of the best live jazz in the country!). Opened in the Gaslamp Quarter in 1990. Offering one of the most extensive wine list and the finest Italian food, Trattroia La Strada has been attracting for years the finest local clientele as well as hosting some of the most prestigious corporate parties in San Diego. Conveniently located in the heart of San Diego´s Gaslamp Quarter near Horton Plaza shopping mall and parking, the hotels, and the Convention Center. On the most bustling corner of North Beach famed Little Italy, Trattoria Pinocchio offers the ultimate taste of Italy. Owner Giovanni Zocca, manager Enzo Giglioni and chef Salvatore Fraterrigo brings you the best of their native Sicily. Savor homemade pastas, filet mignon, veal, seafood and cioppino, speciality Italian deserts, superb wines, and signature cocktails and coffees. The heated sidewalk cafe and floor-to-ceiling windows offer perfect people-watching. Tra Vigne's commodious kitchen is the heart and soul of this enchanted enclave. The chefs' credentials are stellar, naturally. Just as important, though, team members from executive chef on down bring to that arena of ovens and stoves and pots and pans a singular hallmark: passion. Their creations--from antipasti to pastas, entres and desserts--pay passionate homage to traditional Italian cookery while importing the enriching element of American innovation. Call it "Neo-Italiano," if you like. Uva is a traditional southern Italian-style trattoria. From Minestrone soup to Braciole Pugliese, we hope that you will find your family's Italian favorites. Uva is located in gorgeous Downtown Napa within walking distance of the Opera House, Movie Theatres, The Mall and at least 7 different Wine Tasting Rooms! Not to mention there is public parking directly across the street. Uva is a wonderful place to bring your family and friends whether it is an intimate dinner or a grand feast! Experience Villa Romano! Owner and Chef Daniel Guillen proudly offers Northern Italian cuisine and refined service. Our menu specializes in fresh pastas made on site. Savor entrees like our grilled, marinated New York steak with a Greek olive cabernet sauce, or grilled Atlantic salmon, served over cappellini with a mango papaya salsa. Choose from our wine list, featuring over 150 labels. Visit us to view our constantly-updated Captain's Wine List. Enjoy fine dining in an elegant, relaxed atmosphere. Originally built as a stage stop in 1855, the two-story restaurant now resembles a cozy home, with a fireplace, candlelight dining and a warm decor. Voted "Best Italian Restaurant," Vito and his family prepare their recipes with an Old World Flair in a casual and friendly atmosphere. Relax and choose from a menu which includes an extensive array of antipasti; fresh fish, chicken, veal, and pasta entrees; and an irresistible dessert menu (including a family-secret tiramisu) - and in true Sicilian fashion, no one walks away hungry.